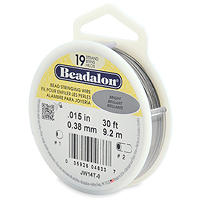 1) Cut 5" from the 15" length of beading wire and thread on one crimp bead and one end of the length of chain. Take the wire around and back through the crimp bead. Pull so that the crimp bead cinches to the last link on the chain. Crimp the bead closed with your Crimping Pliers. Cut off the excess wire with your sidecutters. 2) Thread on one of the turquoise nuggets, followed by a silver round bead. Repeat this pattern three more times. 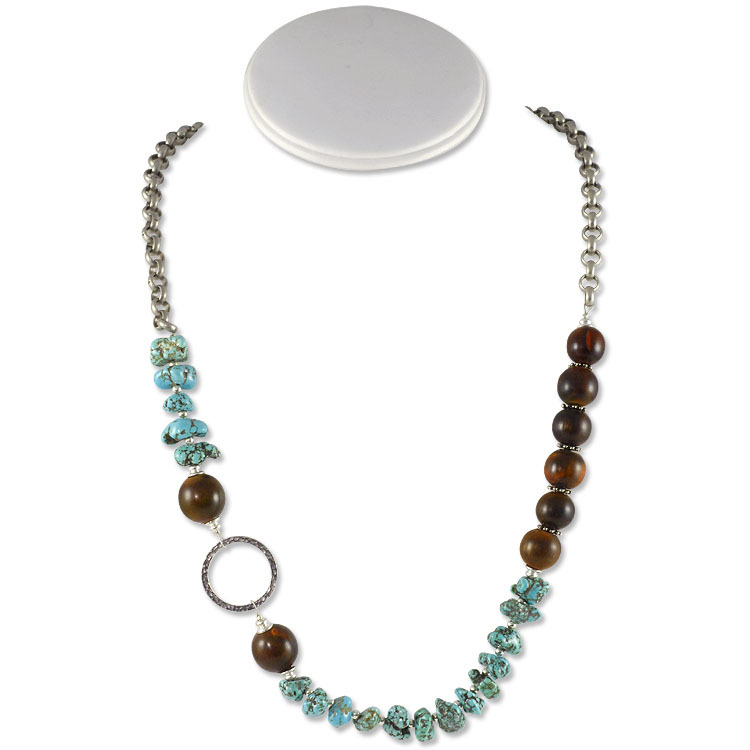 Thread on another turquoise nugget followed by a silver bead cap, a horn bead, another silver bead cap, a crimp bead and the silver connector. Take the wire around and back through the crimp bead. Pull so that the slack is removed from the beadwork and the crimp bead cinches up to the open connector. Crimp the bead closed and cut the excess off with your sidecutters. 3) Now take the 15" length of wire and thread on a crimp bead and then take the wire through the open connector and then back down through the crimp bead. Pull tight and crimp the bead closed with your crimping pliers. Thread on a silver bead cap, a horn bead and another silver bead cap. Then thread on a turquoise nugget followed by a silver round bead. Repeat this 11 more times. Thread on the last turquoise nugget. 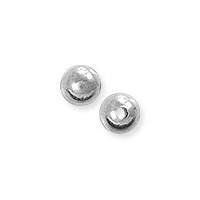 4) Thread on a silver bead cap and a horn bead. Thread on a silver spacer followed by a horn bead. Repeat this pattern four more times. Thread on the last silver bead cap and the last crimp bead. 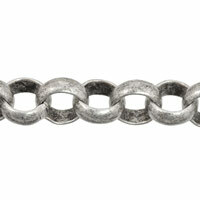 5) Take the end of the wire through the free end link of the chain and then back down through the crimp bead. Pull so that the slack is removed from this portion of beading and the crimp bead cinches up to the chain. Crimp the bead with your crimping pliers and then cut off the excess wire with your sidecutters. Done.